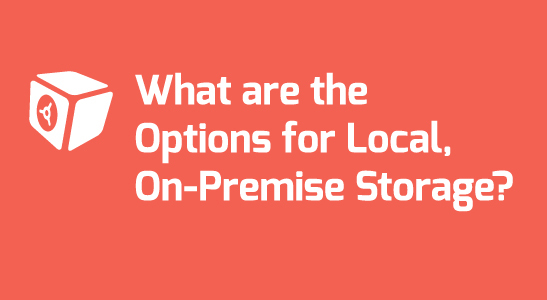 What are the Options for Local, On-Premise Storage? The majority of computer users are aware of the developments in the CPU and GPU technology. They know when the new-gen processors are going to hit the shelves, or what are the best GPUs for high-end 3D animation or other GPU-based software such as CAD. While these technologies get all the limelight, other integral components of a computer system, such as the storage is put on the backburner. By using a better storage than the traditional options, you can not only improve the boot time significantly but also minimize the chances of data corruption. The mechanical drive, or the hard disk drive (HDD) was invented more than six decades ago, but it is still one of the most popular storage devices around the world. The reason is simple — it is inexpensive, but proved to be reliable. You can get a 6TB hard drive from Seagate or Western Digital for anywhere about $300 USD. One major problem with mechanical drive, however, is its limited speed. The average reading and writing speeds of a standard 7200rpm hard disk drive are 128MB/s and 120MB/s respectively, which can be considered slow by many companies. Mechanical drives also tend to have a short lifespan. This is because the moving parts (actuator arm, reading head) inside the device are delicate, and even a strong jerk or blow can render it dysfunctional. In comparison to mechanical drives, an SSD is certainly a major improvement. Not only its transfer rates are impressive (200 MB/s to a maximum of 1500 MB/s easily), but also it is far more reliable. This is because unlike the mechanical drives, SSDs don’t have any moving parts inside them, and hence the name “Solid State Drive” given to them. While solid state drives are usually recommended over mechanical drives, they do come at a high price. A mere 1TB SSD will cost about $450 USD — https://goo.gl/IHqXcC. Thus, they are typically used as the primary boot drives in laptops and desktops, and not for storing large amounts of data. Many small-scale and medium-scale IT companies use Network Attached Storage (NAS), mainly for backup purposes. This is because you can plug in as many hard drives in the system and store large amounts of data. Implementing a RAID system is also easy with NAS. Since NAS network is always active, you can also use it for implementing automated scheduled backups. Cloud backup and storage allow you to access your files and documents from multiple devices at any time, from anywhere. Data Deposit Box (DDB) provides on premise and cloud data backup services. DDB’s Smart Storage devices, powered by its patented continuous data protection technology, offer the SMB a cost effective local & cloud storage and recovery solution for Files, Folders, MS Exchange, SQL, VMWARE, System State, Bare Metal & more. IT experts recommend using cloud backup and storage services as the primary option, and add on-premise, local backups as a secondary solution. Cloud service providers have in-house experts, whom you can get professional support from. If you are looking for convenience, reliability, compliance, and top-notch data security measures, then cloud backup and storage service coupled with on-premise local storage is your best bet. If you are already using a storage system that’s not cloud-based, we encourage you to take action as soon as possible. Why not contact DDB and find out if cloud-based and on-premise backups are for you? https://datadepositbox.com/wp-content/uploads/2017/02/local-storage-blog.jpg 300 547 datdepbox https://datadepositbox.com/wp-content/uploads/2018/08/datadepositbox-logo.png datdepbox2017-02-24 11:22:582017-02-24 11:22:58What are the Options for Local, On-Premise Storage? 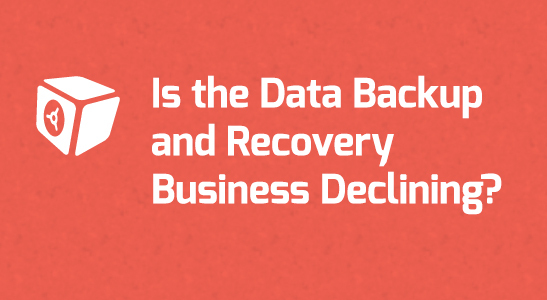 Is the Data Backup and Recovery Business Declining? One of the worst fears of every business owner is reaching a saturation phase. As it has been a long time since the first comprehensive Backup and Data Recovery solution was introduced, IT businesses, especially, Managed Service Providers (MSPs) are wondering if the BDR industry has reached a point where it’s no longer profitable. The answer is a resounding “no”. The Rightscale 2016 State of the Cloud Report  on latest cloud computing trends, sheds light on some important results that show that there is still a considerable gap in the IT industry that can only be filled by MSPs. 32% of the respondents cited the lack of proper resources and expertise as their biggest challenge for not migrating to the cloud. 17 percent of IT companies have 1,000+ VMs in public cloud, a jump from 13 percent in 2015. Hybrid cloud usage also showed growth, and went up from 58% to 71%. 29% cite security issues as a hindrance to moving to the cloud. The facts state the obvious — IT companies still need quality cloud service providers, which not only can provide the bare essentials, but also a comprehensive toolset that can provide full virtualisation, data mobility, disaster recovery, business continuity, and more. Since companies find it very difficult to find experts in the cloud computing space, they don’t get to use their private cloud services to their full capacity. IT companies are also struggling with keeping their costs down, which is evident from the published report. This problem, however, can be easily solved by making use of managed service provider, who has the expertise and can distribute and deploy the available resources in the best way possible. According to a study by MarketsAndMarkets , the Disaster Recovery as a Service (DRaaS) market is estimated at $12 Billion industry by 2020. MSPs specialising in Backup and Disaster Recovery solutions can scale their businesses focusing on that, and grow their business. Most small scale businesses and startups are not prepared for disasters, and since they can’t afford to build a standard recovery system themselves, an MSP is their best option. According to another report, published by MarketsAndMarkets , the cloud storage market size is to grow from about USD 24 Billion in 2016 to about USD 75 Billion by 2021. Such reports are written based on a number of assumptions and as a result, the growth rates might be different depending on who wrote the report. However, one thing that’s certain is that BDR market is here to grow. In order to keep pace with the growing demand and stay on top of the developments, a competitive MSP must ensure that they are clear in communicating their messages to their customers. All parties involved — the vendor, the MSP, and the customers — need to put an effort in understanding why MSP services can benefit their businesses. https://datadepositbox.com/wp-content/uploads/2017/02/Is-the-Data-Backup-and-Recovery-Business-Declining.jpg 300 547 datdepbox https://datadepositbox.com/wp-content/uploads/2018/08/datadepositbox-logo.png datdepbox2017-02-16 10:41:552017-02-16 10:41:55Is the Data Backup and Recovery Business Declining? Technological advances have made it simple to transition from tape backup to cloud backup and recovery solutions. However, migrating years of data to the cloud is not a simple task. It requires thoughtful consideration. Which Data Need to be Migrated? Not all data needs to be migrated from tape to the cloud. Data lifetime requirements have an impact on what kind of data needs to be migrated from tape to the cloud. Short life term data may or may not be migrated to the cloud. The data can be retained on tapes and the server running the proprietary backup software may be maintained by the customer till all the lifetimes of the data have expired. Thereafter, the server and the software can be retired. Data with long-term data lifetime requirements will have to be migrated to the cloud to comply with present legal requirements for that data. Tape technology itself is changing. The newer technologies / software is not made backward compatible, and much of the data copied onto tapes in the past become irrecoverable. Further, the tape owners and cloud vendors may not have access to the software that can read the data. So, the data will have to be read at the customer location using the appropriate proprietary software that was used to write the data and the output copied to a temporary location before it can be transferred to the cloud vendor’s storage. One of the significant advantages of migrating tape to cloud is the potential optimization and de-duplication of data. Incremental backup, differential backup and a host of other kinds of backup technology can be used to ensure that backup happens continuously or within a scheduled time frame efficiently and effectively. Backup failures can be tracked and corrected instantly with alerts being generated for every success or failure of a backup. Replication of data or mirroring of data is almost automatic in the cloud, but this is not the case if you are using tapes. Disk to disk replication can be automated and data can be replicated onto one or more geographically dispersed servers to ensure high availability of enterprise information. There are no replication costs, transportation costs or extra storage costs involved in the process! Further, the cloud is infinitely scalable and globally accessible, unlike tape backups. Simple web interfaces are available over the Internet and provide secure access to the information stored on remote servers in the cloud from any part of the globe 24 x 7. Data security is ensured with user access protocols and encryption of information in transition and storage. Migrating from tape to cloud is a sign of maturity of the SMB and the enterprise. IT needs to follow technology and the cloud, unlike the tape, makes it easier to do so. 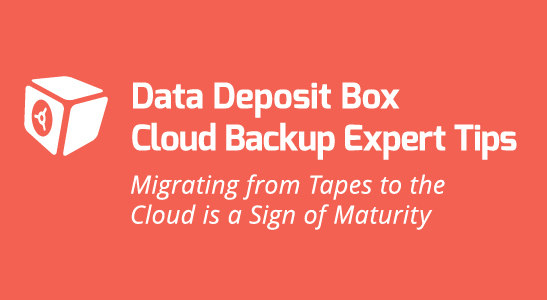 Data Deposit Box (DDB) is an award-winning cloud data backup and recovery solution, specifically designed for small, mid-sized to enterprise organizations. DDB is differentiated by its numerous value-added and industry leading features – agentless technology, on-site portable local storage, multiple off-site data centres, and virtual environments support. About the Author: Troy Cheeseman is the President and COO of Data Deposit Box, a publicly traded (OTC: DBB), Toronto-based cloud backup service provider.